The cheapest way is to take the Tube but it would take much longer. I would assume that TFL (company operating Tube) and South West Trains are working together allowing commuters to use Oyster / contactless... So what is the rationale for different prices for the same distance covered? 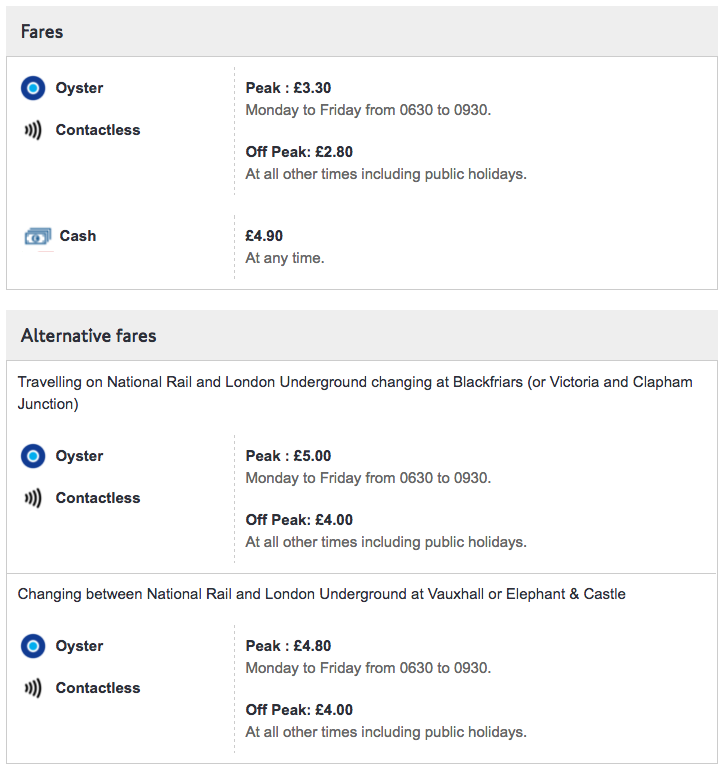 Your assumption that TfL and SWT are working together is wrong - at least so far as fare setting goes. And there are in fact four different fares available to you - although only the first two involve a reasonable journey; the two more expensive ones will be slower than at least one of the cheaper options. State owned TfL in agreement with the Mayor sets fares for journeys that involve only the Underground, the Overground, or both. That's your £3.30 peak fare. There's a political incentive to keep fares relatively low, or you get voted out. The privately owned train companies jointly (as ATOC) set the rail-only fares. These are also valid for journeys on rail + Overground, as historically the Overground was part of the rail. That's a £3.40 peak fare, but only £2.50 off peak. To see these prices, you'll have to search for a journey from Wimbledon to London Waterloo Rail Station. The train companies are limited in the fare rises they can make to certain fares, I believe including these ones. To add to the confusion, the train only peak fare also applies in the evening; all the other fares only have a peak time in the morning. The train companies and TfL both want their slice of the pie on the joint fare, which is the £5.00 one. This is for any journey involving both National Rail and Underground. The fare was really designed for those coming into the rail terminals on the train, then switching to the tube to head into the City (say). The rail companies don't want to accept significantly less from them them than someone leaving the system at Waterloo, and TfL don't want to accept significantly less than anyone else using the tube system (they also want to discourage you from using it for a short journey). Your final option is the £4.80 one. This one's really two separate fares - a £2.40 Zone 2-3 rail fare, and a £2.40 Zone 1 tube fare - Elephant and Castle and Vauxhall are both on the Zone 1/2 boundary. They could charge you the £5.00 fare for this journey, but I guess they're being nice so they charge you the lower option. Aw, that's one of my old commutes (although I lived in Southfields, so pretty much had to take the tube). Without sitting in their pricing meetings, I'd suggest it's supply and demand. As you said, the tube takes longer, but is cheaper. People are prepared to pay more for timeliness / shorter journeys. In addition, there may be more people on one than the other, and people may be prepared to pay more for more comfort. Similarly, by raising prices you can spread load as people look for the cheaper options. Finally, it may cost a lot more to run one than the other, depending on maintenance, fuel and service costs. To offset this and keep it running, they may be required to charge more for it. So to add further confusion to the mix, I think it massively depends on the ATOC. For GWR services, if you travel from a NR station say Drayton Green (Zone 4) to Paddington NR (Zone 1) the cost is £3.90 peak and £2.80 off-peak. However if you then interchange onto the tube at Paddington and continuing to somewhere inside zone 1 like Oxford Circus the price is exactly the same. Doing the same on SWR services, from a NR station, say St. Margarets (Zone 4) to Waterloo NR (Zone 1) the cost is £4.10 peak & £3.00 off-peak, almost the same price. Interchanging onto the tube at Waterloo and continuing to Oxford Circus would mean the total journey price is £5.80 peak & £4.50 off-peak, around 50% for the same number of zones! So much for travelling by zones being equal pricing, no wonder TfL got rid of the fare PDF chart from their website as all these nuances are now hidden! Not the answer you're looking for? Browse other questions tagged london london-underground national-rail oyster-card or ask your own question. How much does a taxi from Southampton to London cost? Why does no connection exist between Euston Square and Euston or Warren Street Underground Stations on the London Underground? Oyster or travelcard for 5 days? Does a ticket to “London terminals” permit travel on the London Underground? How can I find out the default route assumed by TfL's Single Fare Finder?